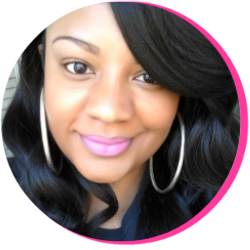 I'm always on the lookout for the best hair care line---you know, products that will give us consumers a full healthy head of thriving and luxurious hair. I mean, aren't we all? The endless aisles of shampoos, conditioners, hair treatments, and styling aids prominent in every superstore are the proof. And while I will say that my days of being a product junkie are no more, I can admit that I'm tempted every now and again to try something new. 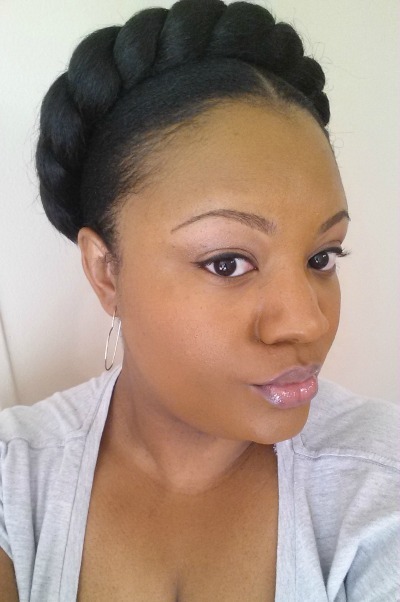 A few months back, I started experiencing breakage and dry, lifeless hair. In an attempt to improve my hair health, I trimmed my hair to shoulder length (once again) and began to take an assessment of my hair care regimen. During this time, I was given an opportunity to try the nuNAAT Garlic Magic Line, formulated with garlic extract to promote stronger, healthier hair. On each wash day for the last few months, I have used the entire nuNAAT Garlic Magic hair care system exclusively (as using products within the same system help maintain the hair's pH balance). The nuNAAT Garlic Magic Hair line is designed to strengthen hair and promote softer, more manageable, healthy looking hair. This formaldehyde and sodium chloride free system states to be "ideal for hair that is especially weak or slow to grow." These things were everything I was looking for in hair care, as I had just cut my hair and was looking to strengthen it as well. Below I will tell you the order in which I used the NAAT Garlic Magic hair care products and my assessment of each one. 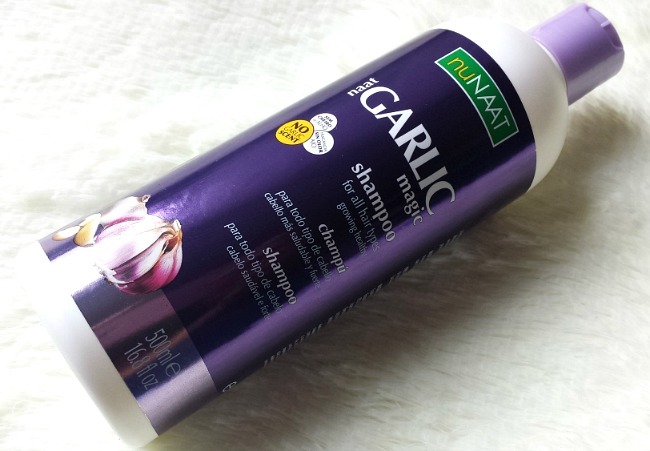 I start off cleansing my hair in one wash with the NAAT Garlic Magic Shampoo. The shampoo is designed to cleanse the scalp of impurities, fight dandruff and excessive oiliness, strengthen hair and fight hair loss. One of my main concerns when using shampoo is making sure it cleanses well without stripping my hair or irritating my scalp. NAAT Garlic Magic Shampoo does a great job of this! Just a little bit of shampoo works up a great lather and cleanses well! And though my hair usually feels dry and brittle after using a shampoo (which is why I most often co-wash), my hair really does feel stronger. The best part, though? My hair smells great! There is hint of a garlic scent at all. 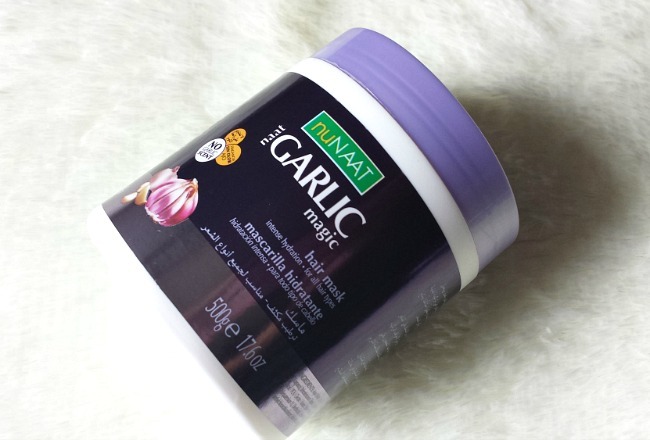 After shampooing and blotting excess water from my hair with a t-shirt, I apply a generous amount of the NAAT Garlic Magic Hair Mask to my hair from roots to ends. This mask states to moisturize and strengthen hair from the roots, promote intense shine, and control frizz. I usually used this mask under heat for about 20-30 minutes and was impressed with the results each time. Again, my hair always felt strong, yet soft after using. But unlike other masks I've used in the past, there was no film or residue left on my hair. 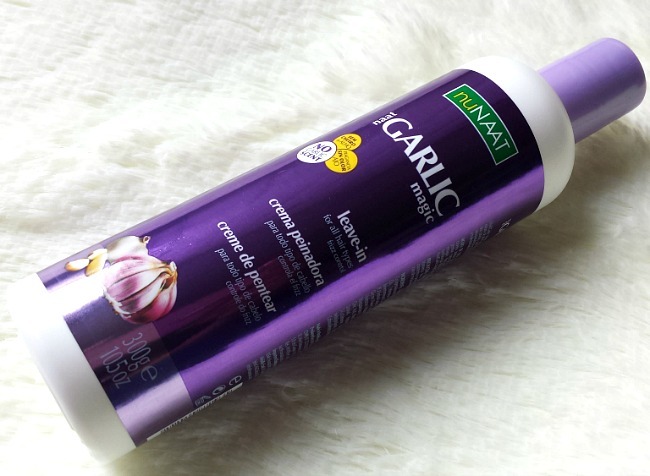 Once I rinsed my hair mask, I always followed up with the NAAT Garlic Magic Conditioner. It promotes stronger, softer, more manageable hair as well. And when I tell you it does make your hair feel softer, I mean it! My hair felt so silky as I rinsed this conditioner off my hair after letting it sit for about five minutes. After rinsing and blotting the excess water from my hair, I applied the NAAT Garlic Magic Leave-In while I air-dried. The NAAT Garlic Magic Leave-In is formulated to control frizz, and repel the effects of humidity--all while being a lightweight, yet effective styling aid. While this leave-in states to give intense moisture, I don't feel like it gives intense moisture and controls frizz alone. I feel like this product is meant to be used (or sealed) with a carrier oil to be able to achieve all of those things. It is, however, a very lightweight cream leave-in conditioner. And it does a great job of keeping the frizzies at bay if you use it when your hair is still damp. Do you see how it kept my normally frizzy edges laid (with no gel, mind you) after removing my scarf and air-drying my hair? And while I haven't noticed a significant amount of growth, I have noticed that my texlaxed tresses do feel thicker. In fact, when I'm rocking my favorite kanekalon protective style, I notice that my edges are looking fuller----and they've never been full at all. 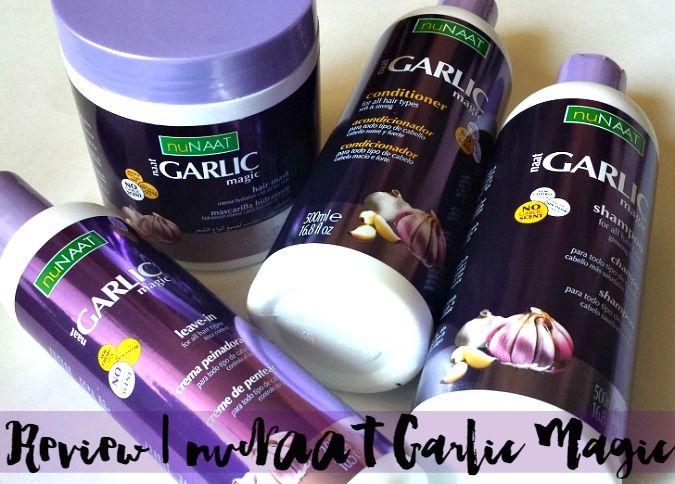 All in all, I can say that I really like the nuNAAT Garlic Magic hair care line. My hair has been much softer, appears fuller, and retains moisture so much better than it did before. The only gripe I have is that the products do contain mineral oil, which may irritate the scalp. And if your scalp is easily irritated, the fragrance in these products may cause irritation for you as well. They were no problem for me, though. Once I do another length check next month, I will remember to take pictures so that I can see if there's been an increase in growth. 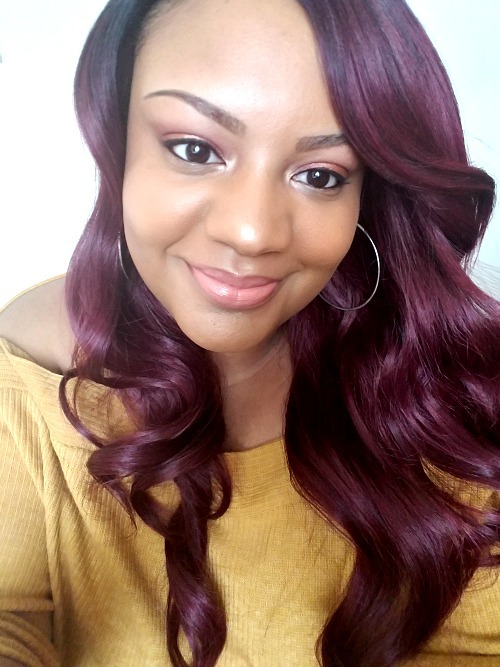 In the meantime, be sure to check out the nuNAAT Garlic Magic line, especially if you've been experiencing a setback in your hair routine and are looking to give your tresses a little TLC. Learn more about nuNAAT hair care products and find a retailer near you by visiting www.nunaat.com. Have you tried the nuNAAT Garlic Magic Line? 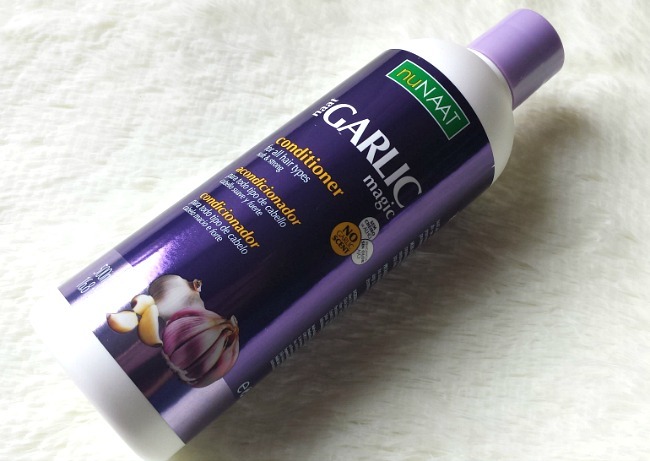 Disclosure: nuNAAT Garlic Magic hair care was sent to me for review by nuNAAT. However, the content and opinions expressed here are all my own. For more information about my disclosure policy, click here.